Foundation stones being laid for the plantation housing scheme at Mawaralawatta. It is only the present government which addressed the needs and shortcomings encountered by plantation workers who have strengthened the country’s economy for over 150 years. Several special programmes have been implemented for their benefit through a new ministry, Finance Minister Mangala Samaraweera said. He was addressing several meetings after opening plantation housing schemes and laying foundation stones for new schemes at Mulatiyana and Marawalawatta in Matara on April 6. Indian High Commissioner Taranjit Singh Sandu and Hill Country New Villages, Infrastructure and Community Development Minister Palani Digambaram were also present on the occasion. The Finance Minister who laid the foundation stones for a new building at the Diddenipotha Sri Murugan Kovil and a plantation housing scheme at Mawaralawatta, also vested a new housing scheme with 15 houses on plantation workers at the Indola Estate. 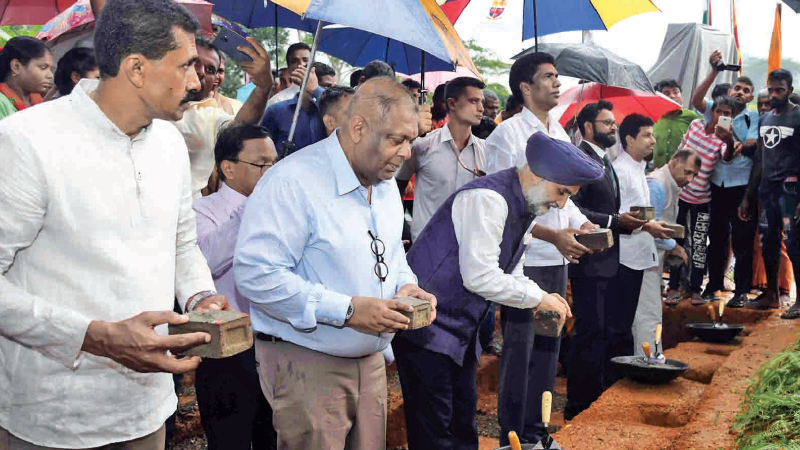 Addressing the plantation workers, Minister Samaraweera said, “You and your kith and kin toiled hard to strengthen the country’s economy for nearly 150 to 200 years enduring difficult living conditions. The income generated to the country had enabled the rest of the people to enjoy free health and education facilities. The country’s economy had remained in a stable condition due to the two leaves and bud picked by you and we are forever indebted to you for that service.” He said since plantation workers had been a neglected section of the masses for a long period a separate Ministry had been created to address plantation worker needs and handed the portfolio to Minister Digambaram, a youthful and talented person. The Minister said apart from the plantation sector the entire country was covered by the Gamperaliya programme which was the biggest accelerated development programme in its history. Gamperaliya was a tangible development scheme rather than a programme limited to mere publicity and fanfare.